At Caliber we monitor public perceptions of companies across Europe, and often publish reputation rankings with conclusions about what it takes to win people’s trust and affection. We were curious to see how results compare across countries, so we selected the 5 highest-scoring locally-owned companies from rankings in Denmark, Sweden, Norway, Finland, Germany and the UK – and merged them to create a unified top 30 “Northern Europe” list. The ranking is based on the year-to-date 2018 Trust & Like Score given to each company among a representative sample of the respective country’s population. We expected the resulting list to feature LEGO, the Danish toy manufacturer that is a perennial reputation icon, at the top. Instead, the Northern Europe Top 30 list is led by the Norwegian dairy manufacturer TINE. TINE’s Trust & Like Score is well above 80 (a score that proves extremely difficult to exceed in most of our studies), which is even more striking given that food manufacturers tend to score low in most reputation rankings, with giants like Danone, Nestlé or Unilever showing average results at best. That being said, the Finnish Fazer is ranked #3 in our table, so there may be something the Nordic food manufacturers have discovered when it comes to wining consumer trust and affection, which global leaders can learn from. The evergreen IKEA is tops for the Swedes as expected, and is ranked in 2nd position in our Top 30 list, being the only other company in our list that achieved a score higher than 80. IKEA does well not only in Sweden, but also in most other markets we measure, which means its reputational success is not just due to being local (as the case may be with many other companies that do well in national rankings), but rather related to its concept and purpose that resonate with middle-class consumers worldwide. It is interesting that the most reputable Nordic companies received higher scores from their compatriots than the highest-ranking German and British companies, and they therefore dominate the top 10 places in our ranking. 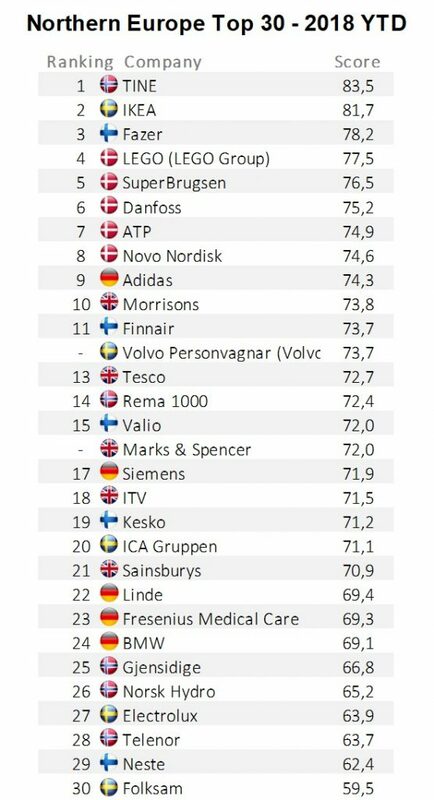 Denmark especially seems to dominate the top with its 5 companies all being ranked in the top 10, While the German Adidas is only ranked #9 and the British Morrisons #10. This fact surprised us and got us wondering whether people in the Nordic countries generally tend to place more trust in companies than people in Germany and the UK do. This would certainly support the general argument heard recently in political and economic circles about social trust being the real asset Nordic countries share. However, a closer look suggests this is in fact not the case. When we looked at the average Trust & Like Score per country (the average score of each country’s top 5 companies) a different picture emerged. Danish companies indeed came out as having on average a significantly higher Trust & Like Score than any of the other countries. 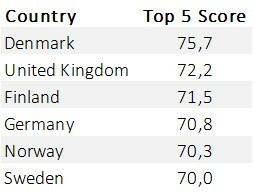 But the UK and Germany were not at all at the bottom of this 6-country average score list. In fact, the UK had the second highest average score, and it’s Norway and Sweden (the 2 countries whose companies occupy the #1 and #2 spots in our Top 30 list of companies) that lie at the bottom. So what is going on here? How can it be the that the highest-ranking British company is ranked only at #10, but the average Trust & Like Score of the 5 British companies is in fact higher than the average for Norway and Sweden, who both have companies ranked in the top 3 of the list of companies? The answer to this question is mathematically simple, but its implications on corporate reputation are anything but. It appears that just like in Denmark, the common trend for UK-based companies is that the top 5 demonstrate similar levels of Trust & Like Score. In Norway or Sweden, on the other hand, the top companies are leading with up to a 10-point gap between them and the runners-up, which is the reason for the low average country score. In other words, opinions in Norway and Sweden seem to be more polarized than in Denmark and the UK. So our Top 30 does not in fact suggest that people in the Nordic countries trust and like their companies more than the Germans and Brits do theirs. Instead it looks like being trusted and liked is just as hard wherever you are, at least when it comes to the 6 countries we included in this comparison. It does however seem that in some countries opinions are more polarized than in others. The lesson for corporate communicators and reputation-builders in countries like Sweden and Norway is that beyond one or two national icons, it may be hard to win the hearts and minds of the public. In places like Denmark and the UK, however, there seems to be a bit more room at the top!